Visual Studio Code>Programming Languages>G-Code SyntaxNew to Visual Studio Code? Get it now. Language synax, IntelliSense, code snippits & more for writing G-Code for CNC machines, 3D printers, CNC routers, etc. 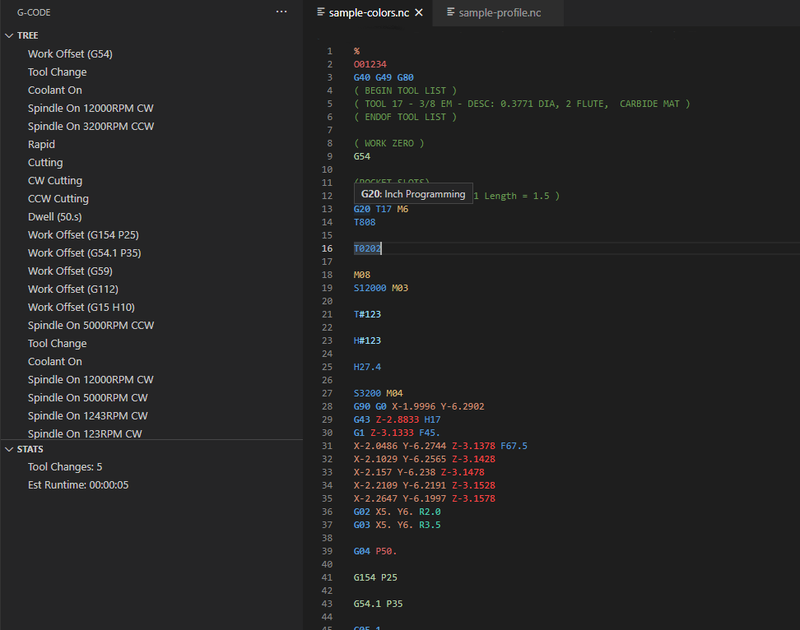 This extension adds language syntax for CNC G-Code, code snippets, and colorization. Install & activate extension. Extension activates when you open a file marked for the gcode language. Please visit our GitHub Issues page for any open issues. Please refer to our CHANGELOG doc. If you work like to help contribute to the code or this project, please fork away and submit pull requests! For more information on contributing, please refer to the CONTRIBUTING doc.